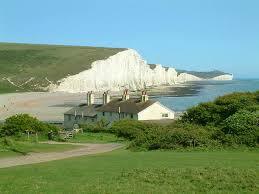 The Seven Sisters - 14 miles, nine hills. The Seven Sisters is considered by many to be the best coastal walk in Southeast England, with classic views of chalk cliffs and beach. Route from Seaford to Eastbourne, with Beachy Head the final hill. It requires a lot of climbing and walkers should be fit. The pace will be moderate, so expect a long day and make no plans for the evening. We will go ahead in nearly all types of weather, and as there is almost no cover, come well prepared with waterproofs and/or hats and sun cream. Bring plenty of water and a picnic lunch for midday, and we can stop for fish and chips at Eastbourne at the end of the day. Travel: 9:17 train from London Victoria (9:22 Clapham Junction) destination Eastbourne. (Change at Lewes arriving 10:20.) Depart from Lewes on 10:28 train - destination Seaford, arriving Seaford 10:47. Walkers meet at Seaford station. Buy a day return ticket to Eastbourne, which covers both routes.